Origin: India, Bangladesh, Myanmar, Nepal and Pakistan. Company:Keep with tetras, Gouramis, small cichlids, catfish, livebearers, barbs, and other minnows. 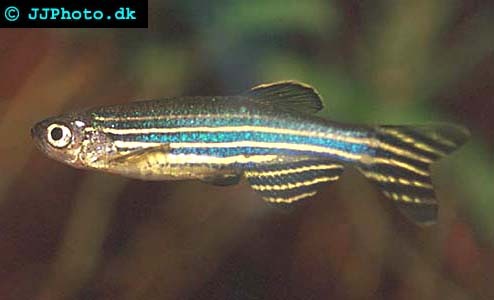 Aquarium setup: Danio rerio (Zebra danio) is very tough and often used to cycle tanks. These fish like to be in groups of 6 or more. They are top dwellers. They are often used as "dither fish" to distract bigger, more aggressive fish. These guys make a great community fish and fish for beginners. They require a tank of at least 10 gallons preferable more. Feeding: Accepts flake floods and live foods such as bloodworms and brine shrimp. Breeding: Move male and female into a separate tank with a layer of round marbles at the bottom. Eggs will fall in between the marbles so the parents can't eat them. Fry usually hatch within 36 hours and look like little white tadpoles against the glass. They become free swimming in 3 days.